Michael spent nearly two decades as a conservative radio talk show host, heard across the country daily on a show syndicated by Premiere Radio Networks. He left this position to travel the country in order to champion President Ronald Reagan’s values and principals in the public policy forum. Michael also serves as chairman and president of The Reagan Legacy Foundation, which seeks to advance the causes President Reagan held dear and to memorialize the accomplishments of his presidency. He has also appeared for years on network television as a commentator and guest on the Today Show, Good Morning America, Good Day LA, CNN, Fox News, and is a Newsmax Television contributor. Michael is also involved in charities and public service, including: The John Douglas French Alzheimer’s Foundation, The Young America’s Foundation, and is on the Advisory Board for Mixed Roots Foundation which helps the adoption and foster care community. Michael is a man who has done everything from debating Mikhail Gorbachev to setting world records in powerboat racing. His racing raised more then $1.5 million for charities like the United States Olympic Team, Cystic Fibrosis, the Juvenile Diabetes Foundation, and the Statue of Liberty Restoration Fund. Michael has authored many successful books including; On the Outside Looking In, Twice Adopted, and his latest book, Lessons My Father Taught Me. 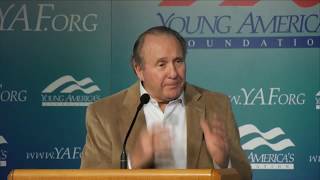 Michael Reagan is exclusively represented by Premier Speakers Bureau.